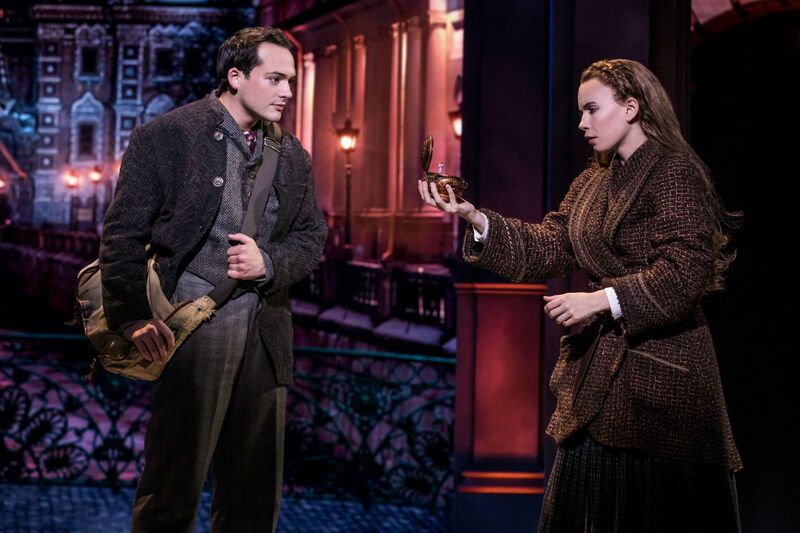 Stephen Brower and Lila Coogan in "Anastasia," through April 21 at the Academy of Music. “You never know when you will say your last goodbye,” the Dowager Empress (Joy Franz) tells Anya (Lila Coogan) in the musical Anastasia. The national tour is at the Academy of Music through April 14. The musical is fresh off its Broadway run, which ended March 31. This realistic yet magical retelling of the 1997 Fox animated film (whose writers included Philly’s Bruce Graham) follows the amnesiac Anya, who after the Russian Revolution seeks love and her lost identity across a backdrop of social upheaval and terror. And what a backdrop this production brought on tour. Alexander Dodge fills the huge panels of his scenic design with as much computer-generated imagery as a Pixar film. Snow falls lightly on a czarist palace, a harsh sun beats down on the columns of the Nevsky Prospect, wind rustles the clouds above the Seine in Paris. Against this backdrop, the con men Dmitry (Stephen Brower) and Vlad (Edward Staudenmayer) train Anya to portray Anastasia, the grand duchess of the Romanovs, who reportedly survived her family’s massacre at the hands of the Bolsheviks a decade earlier. This new retelling keeps six of the film’s songs, to which composer Stephen Flaherty and lyricist Lynn Ahrens (both of Ragtime fame) add 16 new numbers. The two primary locations and periods — 1920s Paris and 1910s St. Petersburg — infuse the score with a jubilant swing and lush, romantic melodies that tug at the heartstrings. Coogan’s voice beams in hopeful numbers (“Journey to the Past,” from the film), inviting the too-eager opening-night audience to root for her audibly. As the villainous General Gleb, Jason Michael Evans lumbers across the stage and the European continent like a Frankenstein’s monster, but his rich baritone captures the humanity of a man torn between conscience and country. Linda Cho drapes the actresses in miles of gowns and dresses, highlighting the opulence of the aristocracy, lost to the drab, lifeless colors of the socialists who replaced them. Peggy Hickey’s choreography, by contrast, creates lively infusions of the Charleston with Russian Cossack dancing. With the CGI of Dodge’s set design, the costumes and dancing imbue Anya’s quest with pomp and charm. Playwright Terrence McNally’s book grounds Anya’s fantasy with touching moments of Chekhovian longing. In this 2½-hour production, his contributions add up to as much as a full nonmusical play. Throughout, Darko Tresnjak’s direction never lets us forget the stakes — the real human drama embodied in the many imposters to the Romanov lineage — while always celebrating the eternal, hopeful quest to find and create one’s self anew. Don’t miss your chance to say hello to that hope on this touring production’s short run. Through April 14 at the Academy of Music, 240 S. Broad St.. Tickets: $25-$149. Information: 215-893-1999, kimmelcenter.org.